This assessment task is located within Area of Study 2 of Unit 1 Business Management, in accordance with the Victorian Certificate of Education Study Design stipulated by the Victorian Curriculum and Assessment Authority. 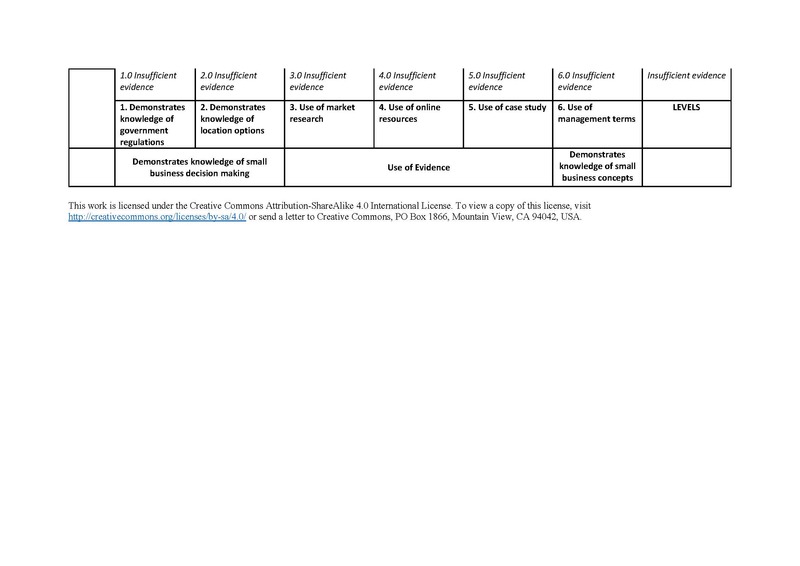 While it is not possible to situate this assessment task within a particular curricular “Strand”, the capabilities and used for the rubric may be derived by examining the “Key Knowledge” and “Key Skills” for Area of Study 2, from which indicators are in turn derived. This is illustrated by the following graphic. Students are given a case study describing a potential business owner and their idea. The students are required to develop a section of a business plan advising the potential owner of a suitable location for their business including marker research and compliance with the legal and government regulations. The students are required to research the location and justify their recommendation referencing evidence. Purpose The purpose of the Unit 1 SAC is to assess students knowledge and skills with reference to unit 1 AOS 2. 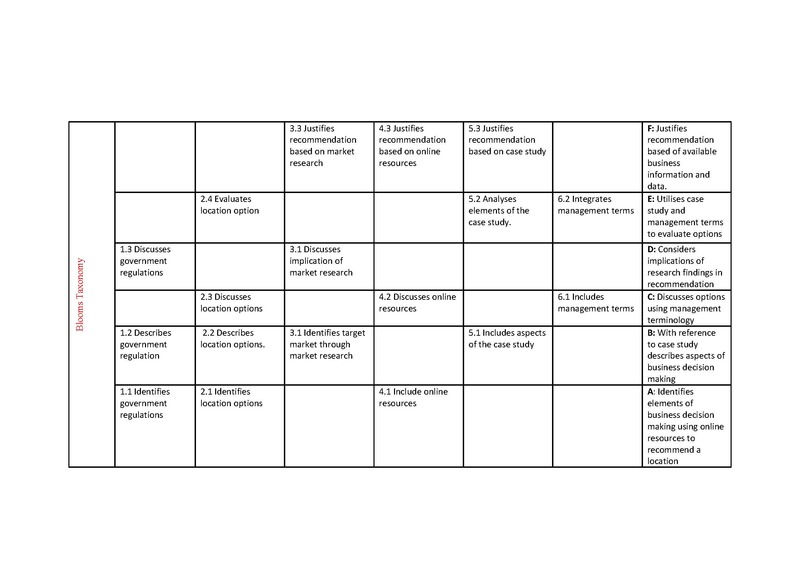 This is a summative assessment task that will be used to rank students on a standards reference scale. Administer The SAC is a open book written report completed individually with access to online resources. Individuals can discuss ideas with the teacher providing assistance as required. The task will be completed over 3 50 minute lessons, due the following week. Record Each students marks were added to an excel spread sheet and the rubric is photocopied and kept in a result folder. Student work is returned to individuals and the grade was incorporated into the student’s end of semester report. Interpret The SAC was at the end of the unit and only the marks/grades were interpreted. Written feedback and the rubric is provided for student improvement. Use The assessment was used as a reporting tool in parent teacher interviews and on end of semester reports. The teacher could focus on areas of weakness to re-cover before the exam. 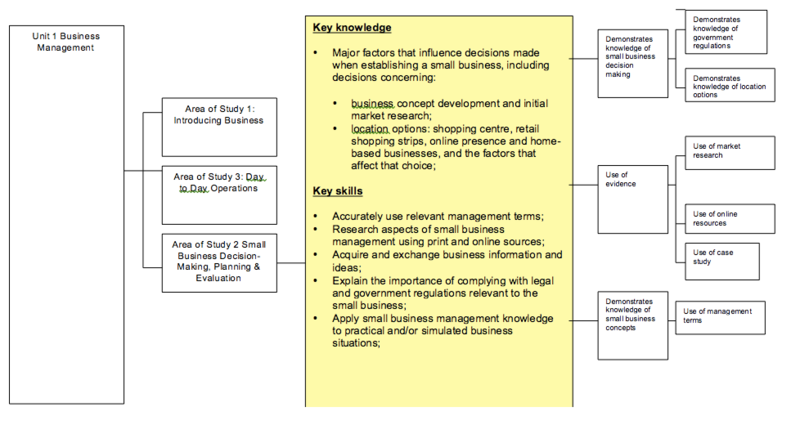 Outstanding The student can synthesise information to form a recommendation of the most suitable location for the proposed business.The student justifies location based on a detailed understanding of available information including extensive referencing to the case study and management terms. High The student forms a recommendation of a suitable location for the proposed business, based on an analysis of the benefits and limitations of available locations, and having regard to government regulations and market research. Medium The student can describe and discuss information relating to location options, government regulations and market research, and understand the impacts of these aspects on business decision-making. Low The student can identify information about location options, government regulations and market research, and locate resources.